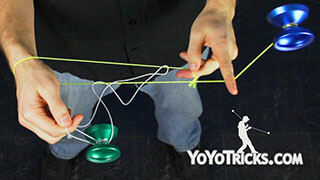 Learn the Big Dipper 3A trick. 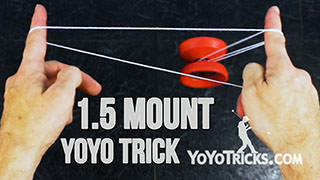 Now before starting this trick, you want to make sure that you know how to do a 1.5 kink mount. So if you have not already, check out that video. 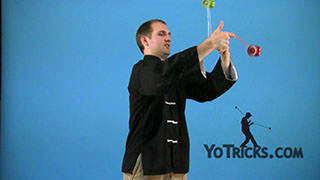 We are going to break the trick down into a few parts. 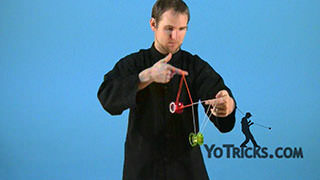 The very first part is undoing the kink mount to set yourself up for the Big Dipper. 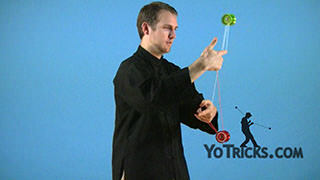 The easiest way to learn that is just with one yoyo. 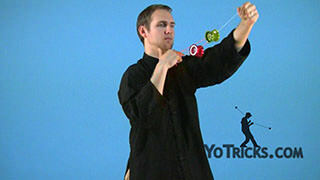 What you are going to do is practice with your dominant hand, throwing a 1.5 mount. 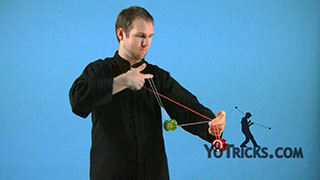 Then you are going to unmount the yoyo and you are going to take your dominant index finger and pinch the string. 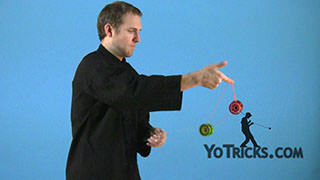 From here, you are going to take the yoyo and you are going to throw it over. Just like that. 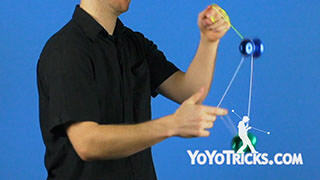 You just want to get smooth at that, get that motion all in one, unmounting, pinching, and throwing the yoyo. Once you are used to that, we are going to put it into the kink mount. So you will want to get into your kink mount, just like this. 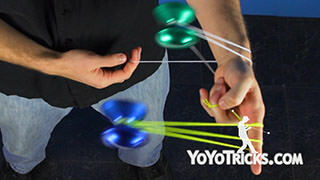 You are here, you are going to dismount the yoyo, pinch, and throw over in between both of your hands. 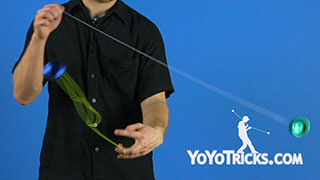 You will notice that there is two strings. I will show you from a different angle here, what string you are going to land on. 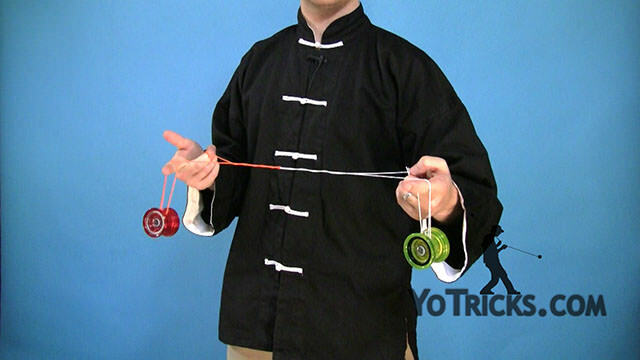 We get into that kink mount, again we unmount the yoyo, we pinch, we throw the yoyo in between both hands, and you see there is a front string and a back string on your non dominant hand. 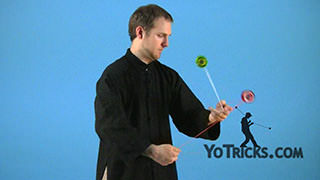 You want to land the yoyo on the back string, that string that is closest to you. Then from there, we can do a roll and then a second roll. That gets you into a big dipper mount. I will show you those rolls one more time. 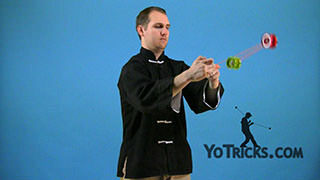 Kink mount, dismount, throw over, land it on that back string. You are going to roll with just your dominant yoyo into the string. 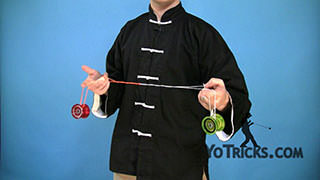 Then, both yoyos. That gives you that big dipper mount. 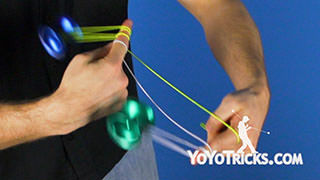 The easiest way out is just to pop the dominant hand yoyo out the front, and you can bind and bring the yoyos back to your hand. But there is another way to dismount that I prefer. 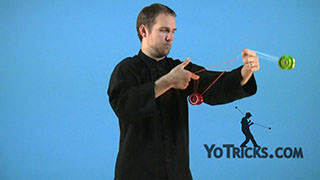 That is once you have ended the trick, you get into it, land that yoyo, do your rolls. 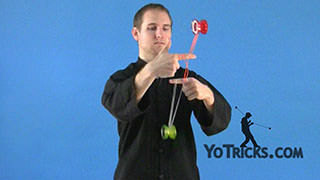 What I like to do is pop the yoyo out front and then take the loop on my index finger and put it on my thumb. 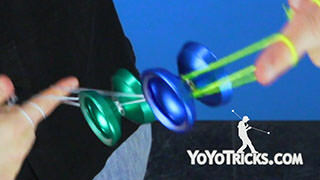 Then mount my dominant yoyo over my index finger again, so both yoyos are mounted. 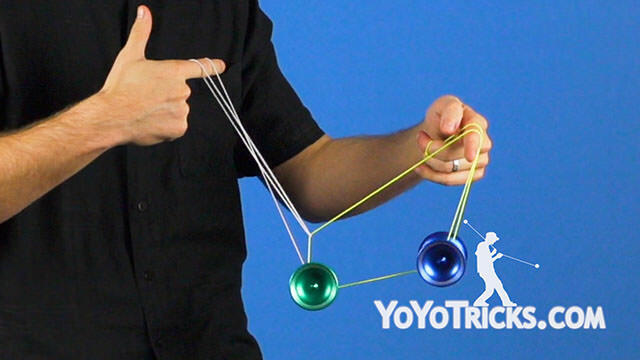 You can drop the strings at the same time. 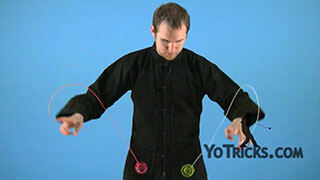 Then bind your dominant hand. 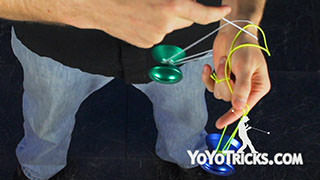 And that creates a kind of magic knot effect, it sets you up for a nice bind in your dominant hand. 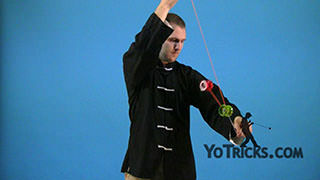 You can bring your non dominant hand back however you like. Once you have got the whole thing, that is the big dipper.